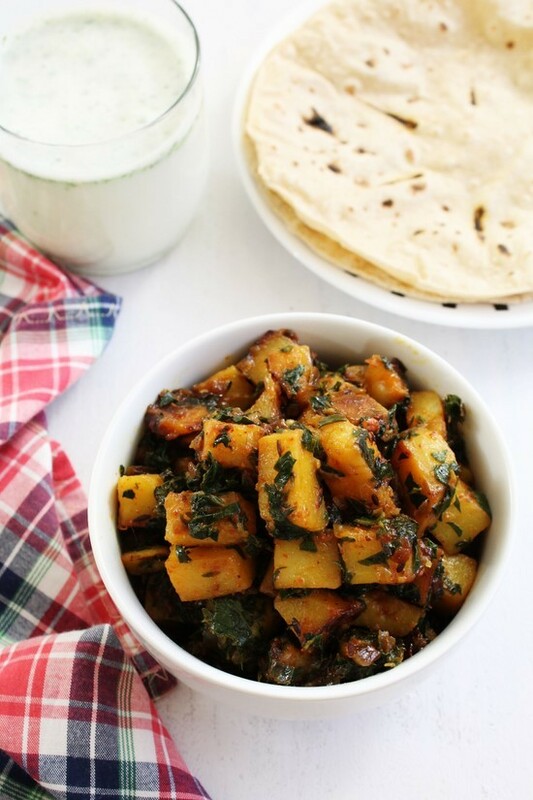 Aloo methi recipe – a dry vegetable dish aka sabzi made with potatoes and fenugreek leaves. This sabzi goes well with roti or paratha. Methi leaves or fenugreek leaves are very nutritious. It is full of Iron and so one should include it in their diet at least once a week. I know plucking the leaves and cleaning it very tedious job. So I usually do this task while watching TV or movie and if you get some more hands to help, that’s perfect. Alternately you can use frozen methi leaves instead of fresh leaves. Methi leaves has bitter taste, but here in USA we do not get that much bitter leaves. If your methi is too bitter or you do not like bitter taste, I have already mentioned the trick to get rid of methi leaves in the instructions. You have seen many methi leaves recipes on the blog and so you might know that I love methi leaves, and of course dear hubby too. This potato and fenugreek leaves combination is popular in Punjabi cuisine. Though I grew up eating it in Gujarati family. There might be many people who enjoys it and who are from different region. 1) This is optional step. How to remove the bitterness of methi leaves? Wash the methi leaves well, sprinkle some salt on it and keep it aside for 10-15 minutes. meanwhile prep other ingredients. 2) after 15 minutes, using your hands squeeze all the water from leaves and then chop it. Sometimes I skip this step. Because here in USA, I don’t get that much bitter methi leaves. 3) Heat the oil in a pan on medium heat. Once hot add cumin seeds, let them sizzle. 4) Add dried red chili and saute for a minute. 5) Mix in the onions. Sprinkle some salt to speed up the cooking process of onion. 6) Cook them till they are translucent and soft. 7) Then add ginger paste and garlic paste. 8) Mix and cook for a minute or till the raw smell of ginger garlic goes away. 9) Add potatoes, turmeric powder, red chili powder and remaining salt. 10) Mix well, cover the pan and cook the potatoes. 11) Cook them till potatoes are soft and 80% cooked. Do stir in between to make sure that it is not sticking to the bottom of the pan. 12) Add chopped methi leaves. 13) Mix well and again cover and cook. 14) Now cook till potatoes are cooked all the way through. 15) Finally squeeze some fresh lemon juice. 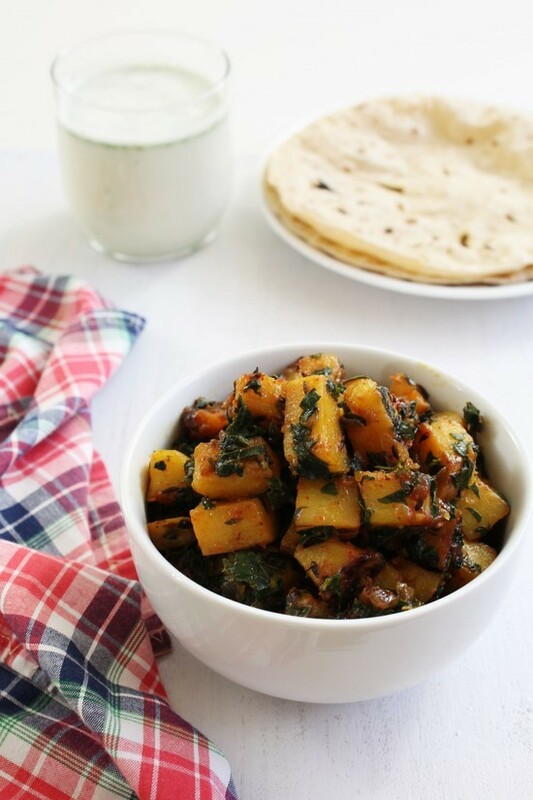 Whenever you buy methi leaves, I highly recommend that you make this aloo methi subzi. It is very flavorful and delicious. Do let me know how you like it in the comments below. 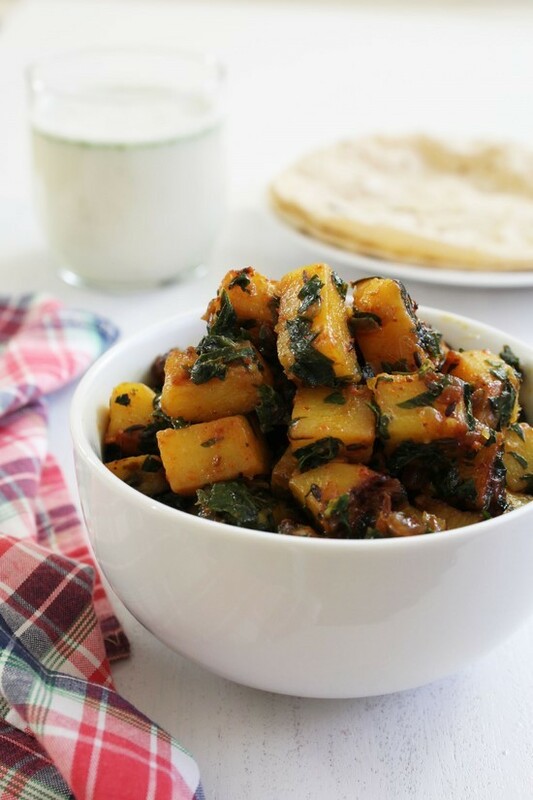 Serving suggestion: This aloo methi sabzi is dry dish, so best served with roti or phulka. But you can serve with paratha too. To complete the meal, also have dal-rice on side. If you don’t get fresh methi leaves in your area. You can use frozen methi. Let the frozen leaves defrost on the countertop or you can defrost it in microwave. Once thawed, squeeze out all the water and then use in the recipe. You can make aloo methi with baby potatoes as well. If using the baby potatoes then I would suggest parboiling or half cooking them first and then saute in the recipe. This way it saves some while cooking. If you have boiled potato in the fridge and want to use in this recipe. Add boiled, cubed potatoes. 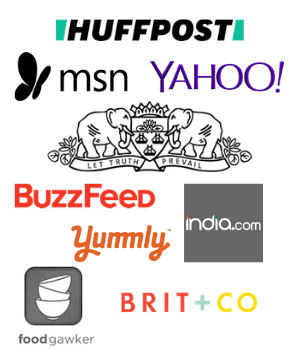 Saute for 1-2 minutes uncovered. Then continue with next step of adding methi leaves. This is optional step to remove the bitterness of the methi leaves. Wash the methi leaves well, sprinkle some salt on it and keep it aside for 10-15 minutes. meanwhile prep other ingredients. after 15 minutes, using your hands squeeze all the water from leaves and then chop it. Add dried red chili and saute for a minute. Mix in the onions. Sprinkle some salt and cook them till they are translucent and soft. Then add ginger paste and garlic paste. Mix and cook for a minute. Add potatoes, turmeric powder, red chili powder and remaining salt. Mix well, cover the pan and cook the potatoes. Cook them till potatoes are soft and 80% cooked. Do stir in between to make sure that it is not sticking to the bottom of the pan. Add chopped methi leaves. Mix well and again cover and cook. Now cook till potatoes are cooked all the way through. Finally squeeze some fresh lemon juice. Very happy to know that it came out good.